brochures, business cards silts are available free of charge. This promotion may be used with other valid promotions (including those found on external websites). Side 1 printed with 2 PMS colors using light coverage. 100lb White Linen stock uncoated. H1 business card slits on right pocket. 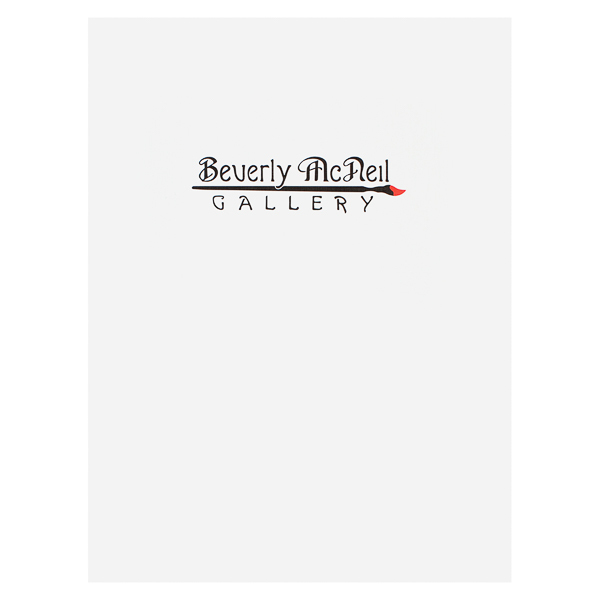 The Beverly McNeil Gallery promotes its art exhibits with a modern, minimal design. The Birmingham gallery's logo features decorative typography and a paint brush whose red bristles are the only color on the design. Contact information runs in a slim line on the bottom of the back panel, staying visible yet inconspicuous. Four-color process printed on Side 1 of uncoated 80lb Smooth White stock. H3 business card slit on left pocket. 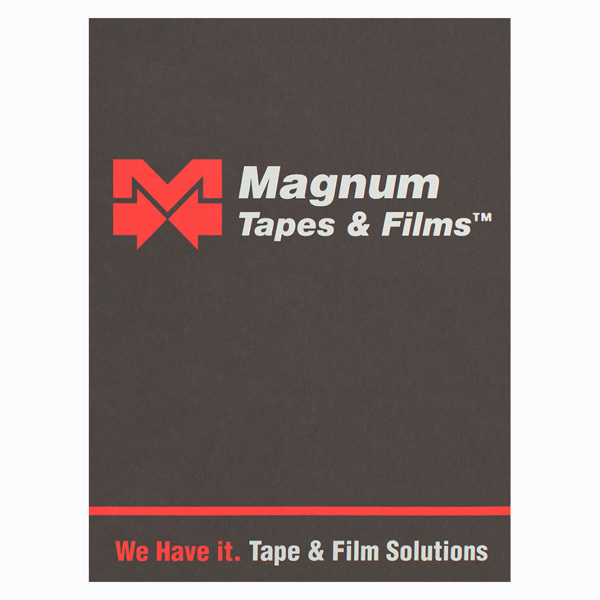 Magnum Tapes & Films uses a professional gray background for its folder. Red in the logo and tagline make those points stand out and creates a sense of urgency. The logo looks like a capital M with two arrows pointing toward one another. Inside, the extra tall gray pockets stand out against the white panels. The company's mission statement, name and logo are on the right pocket. Contact information is on the back, along with the brand's name and logo. Four-color process printed on Side 1 of 14pt C1S White Semi-Gloss stock coated with Aqueous Soft Touch. H2 business card slits on right pocket. 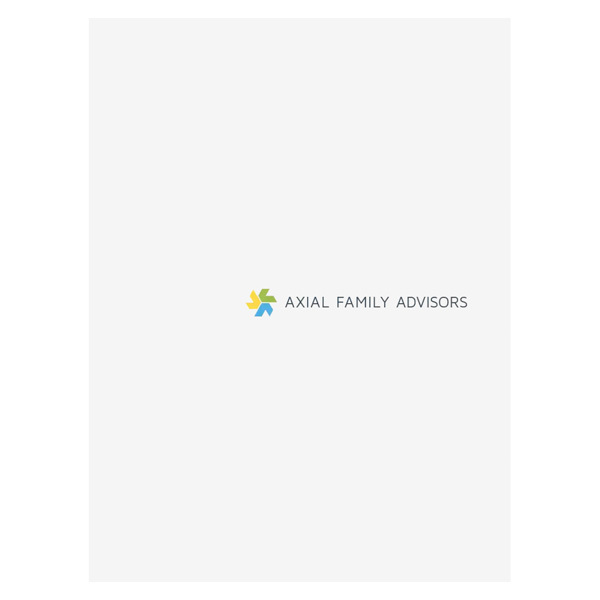 Axial Family Advisors chose a minimalistic design for its cover, featuring only its name and logo on a clean, white cover. The logo looks like a multi-colored pinwheel to represent the many facets of financial planning that the company handles. Blue pockets inside evoke feelings of security, which is what clients want from a financial planner. The back contrasts with the front with a dark blue background and the company slogan and logo in the center. Side 1 printed with 2 foil stamped areas on uncoated 18pt Eco Brown Kraft stock. H3 business card slits on left pocket. 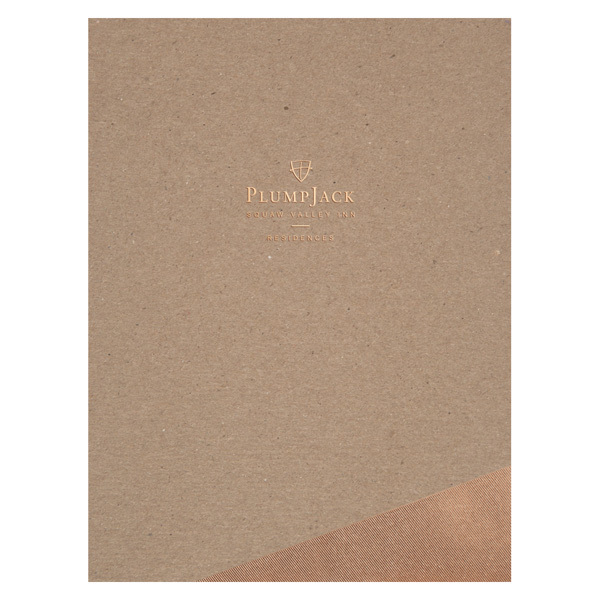 PlumpJack highlights its commitment to the environment with an Eco Brown Kraft stock made from recycled materials. The Metallic Copper foil stamp adds a smooth texture to the cardboard-like stock. It also adds shine to the design and makes the Inn's name and logo stand out in the center of the cover. Inside, the inspirational phrases "Dreamers, Doers & Champions, This is for You" appear on the pocket. Two super-sized pockets cover more than half of the 8 1/2" x 11" print materials. Standing 6" tall, they reduce the risk of documents slipping or falling during use. A deep v-split creates flexibility and prevents the pockets from buckling when closing the cover. The additional height also provides ample room to include custom graphics or text while still maintaining a clean and elegant look.